Over the next two weeks, the four brightest planets, Mercury, Venus, Mars, and Jupiter, perform a complex dance at dawn. If you look closely at the eastern horizon just before sunrise for the next two weeks, you should notice the bright planets Venus and Jupiter. Look closer still, perhaps with the help of binoculars, and you should spot two more planets, Mercury and Mars. If you follow the four planets from one morning to the next, you should see some remarkable changes in their positions, as indicated on the sky map of the planets available here. As you can see, three planets begin the two-week stretch in a tight triangle: brilliant Venus and Jupiter above, fainter Mercury below. Mars is way off to the left. Jupiter behaves as you would expect of a normal morning object, moving higher and farther to the right each morning. Mercury and Venus are both on the far side of the sun and are moving rapidly with retrograde motion toward their next superior conjunctions with the sun, on June 13 and Aug. 16, respectively, so seem to move from right to left. Mars is just past conjunction with the sun and is mainly moving straight upward from the horizon. Because of the different tracks each of the planets is following, they will all experience "close encounters" with one another over the next two weeks. Mercury and Jupiter were closest yesterday morning (Tuesday May 10). Venus and Jupiter were closest this morning (May 11). Mercury and Venus are moving parallel to each other, and will be closest next Wednesday, May 18. Mercury and Venus will then pass close to Mars on Friday, May 20, and Sunday, May 22, respectively. Remember that, even though planets may appear close in the sky, this is an effect of perspective. In reality they are all spread over a line nearly six times longer than the distance from the Earth to the sun. The average distance between the Earth and sun is about 93 million miles (150 million kilometers). Use the sky map to tell what's what as the four "morning stars" dance at dawn. 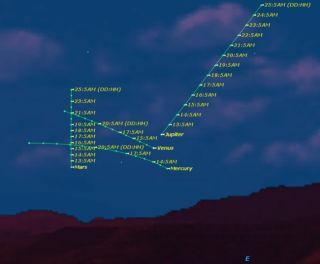 If you snap photos of the planetary dance by Mercury, Venus, Jupiter and Mars and would like to share it with SPACE.com for a possible story or gallery, contact managing editor Tariq Malik at: tmalik[at]space.com.